Photograph of demobilised men handing in their rifles before boarding a ship home, undated. 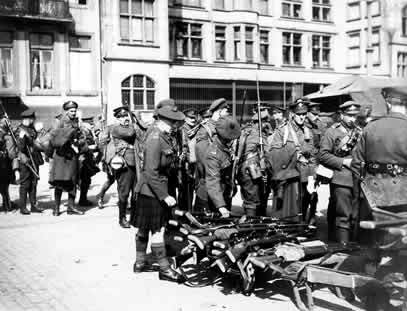 The demobilisation of British troops got under way immediately after the cessation of hostilities in November 1918. It was an arduous process that was not without flashpoints - witness, for example, the unrest that took place in military camps in Calais and Folkestone. The men in this picture, however, look calm - and possibly even subdued - about returning home to civilian life.